TransPose can display graduations on its line so that it can be used for measurements. The graduations are enabled by default and can be changed in the Preferences > TransPose Units sub-palette. The purpose of the units in ZBrush is to let you easily verify the dimensions of an object while working on the proportions of a model. At any time you can set the units value to one of your choice and initialize the length of the action line to 1 unit. Then when you increase or decrease the length of action line, you will be able to measure in the defined units. To give you an example, load the DemoSoldier project. Activate Move and draw on the model to create a action line that has the length of the head. 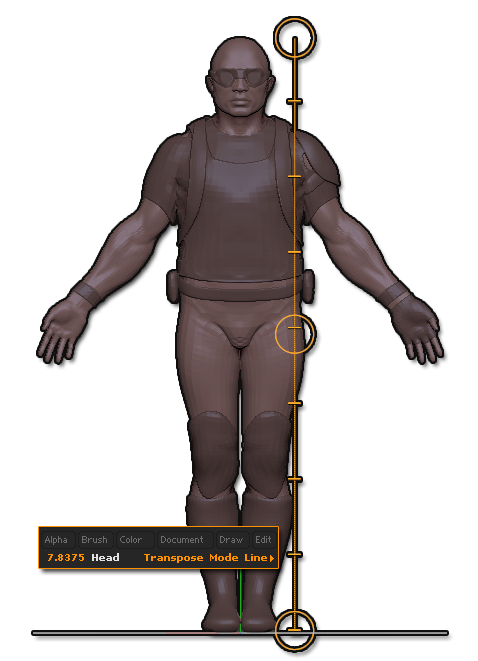 After setting this length to 1 unit in the preferences and naming the units “Heads” (see below), you can increase the length of the action line from the top of the head to the foot to see that the demo soldier is 7.8 Heads in length! Switch to TransPose by clicking on Move, Scale or Rotate while in Edit mode. Move the ends of the TransPose line to define the beginning and end what will be the unit length. Open the Preferences > TransPose Units sub-palette. Change the Units Scale slider value to 1. Click on set units and enter the unit name of your choice. Change the Major Ticks Per Unit slider value to 1. Change the Minor Ticks Per Unit slider to a value of your choice, like 2. The line will display a mark between each major tick. Change the Calibration slider value to 1. This sets the current action line length to 1 unit length. Now drag an end of the action line to increase its length. Notice that new tick marks will appear. Also, the total length will be displayed in the status bar.